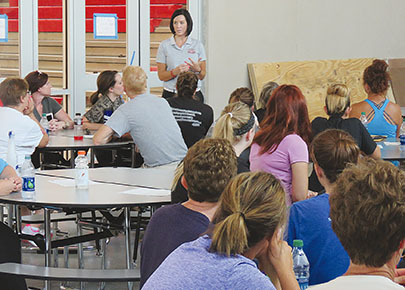 Administrators and teachers met last week in the Boone Central commons area. Boone Central High School and Middle School are starting classes today, Wednesday, Aug. 30. This is a half day of classes, with dismissal at 11:30 a.m. at the middle school and 11:50 a.m. at the high school. Regular starting times, beginning Thursday, Aug. 31, will be 8:10 a.m. for middle school and 8:03 a.m. for high school. 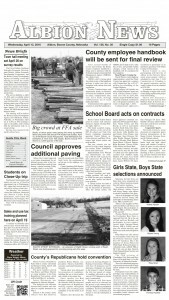 Starting date is delayed for elementary grades K-5. Classes for those students begin next Tuesday, Sept. 5, and students will report to the spectator gym for orientation at 8:05 a.m.
Due to some construction delays earlier in the summer, work was still underway in the science classrooms at Boone Central when high school classes started on Aug. 30. Superintendent Nicole Hardwick said alternative classrooms would be used for science classes this week and into next week while work continues in the science classrooms. More details on school opening in the Aug. 30 Albion News and Petersburg Press. 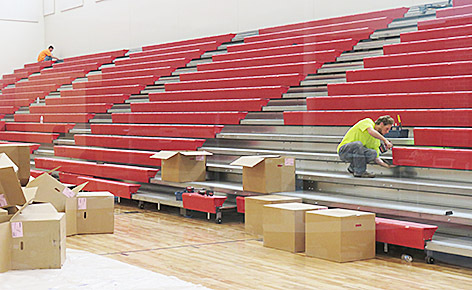 Finish work was underway last week on the bleachers in the new gym.